After separating from the Japanese coast at 36°N, 141°E, the Kuroshio enters the open basin of the North Pacific, where it is renamed the Kuroshio Extension (KE). Free from the constraint of coastal boundaries, the KE has been observed to be an eastward-flowing inertial jet accompanied by large-amplitude meanders and energetic pinched-off eddies (see Qiu 2002 and Kelly et al. 2010 for comprehensive reviews). Compared to its upstream counterpart south of Japan, the Kuroshio, the KE is accompanied by a stronger southern recirculation gyre that increases the KE’s eastward volume transport to more than twice the maximum Sverdrup transport (~ 60Sv) in the subtropical North Pacific Ocean (Wijffels et al. 1998). This has two important consequences. Dynamically, the increased transport enhances the nonlinearity of the KE jet, rendering the region surrounding the KE jet to have the highest mesoscale activity level in the Pacific basin. Thermodynamically, the enhanced KE jet brings a significant amount of tropical-origin warm water to the mid-latitude ocean to be in direct contact with cold, dry air blowing off the Eurasian continent. 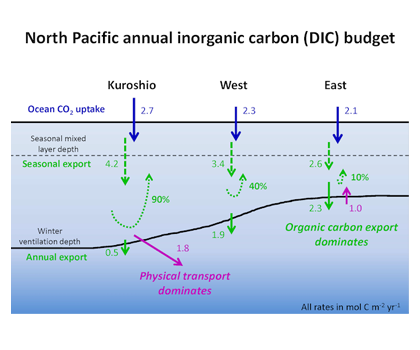 This results in significant wintertime heat loss from the ocean to atmosphere surrounding the Kuroshio/KE paths, contributing to the formation of North Pacific subtropical mode water (STMW; see Hanawa and Talley (2001) and Oka and Qiu (2012) for comprehensive reviews). Figure 1. 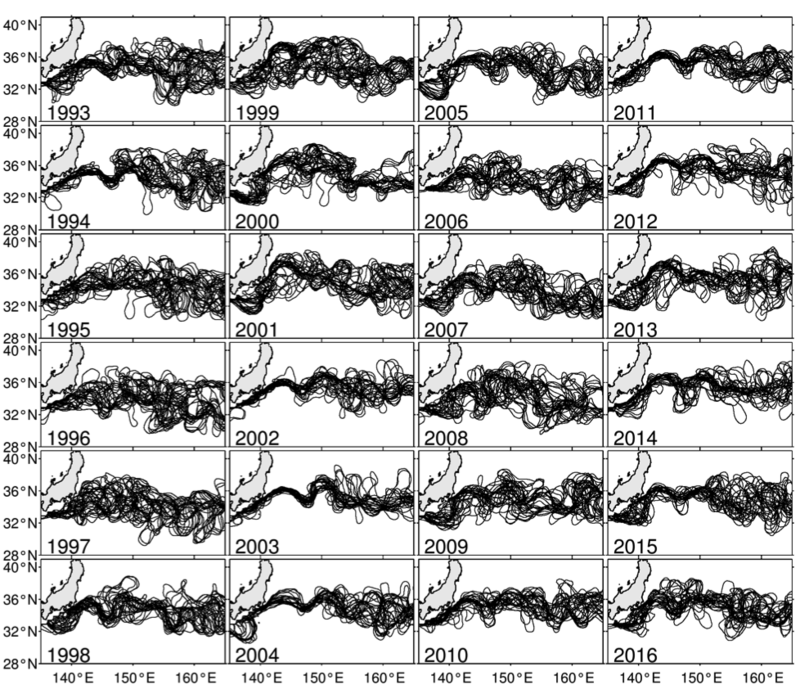 Yearly paths of the Kuroshio and KE plotted every 14 days using satellite SSH data (updated based on Qiu and Chen 2005). 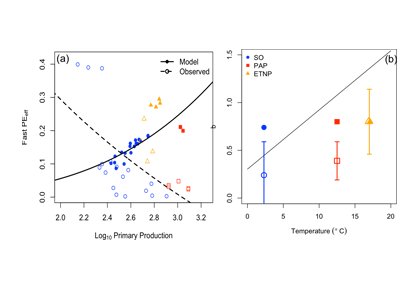 KE was in stable state in 1993–94, 2002–05, and 2010–15, and unstable state in 1995-2001, 2006–09, and 2016, respectively. Although the ocean is known to be a turbulent medium, variations in both the level of mesoscale eddy activity and the formation rate of STMW in the KE region are by no means random on interannual and longer timescales. One important feature emerging from recent satellite altimeter measurements and eddy-resolving ocean model simulations is that the KE system exhibits clearly defined decadal modulations between a stable and an unstable dynamical state (e.g., Qiu & Chen 2005, 2010; Taguchi et al. 2007; Qiu et al. 2007; Cebollas et al. 2009; Sugimoto and Hanawa 2009; Sasaki et al. 2013; Pierini 2014; Bishop et al. 2015). As shown in Figure 1, the KE paths were relatively stable in 1993–95, 2002–05, and 2010–15. In contrast, spatially convoluted paths prevailed during 1996–2001 and 2006–09. When the KE jet is in a stable dynamical state, satellite altimeter data further reveal that its eastward transport and latitudinal position tend to increase and migrate northward, its southern recirculation gyre tends to strengthen, and the regional eddy kinetic energy level tends to decrease. The reverse is true when the KE jet switches to an unstable dynamical state. 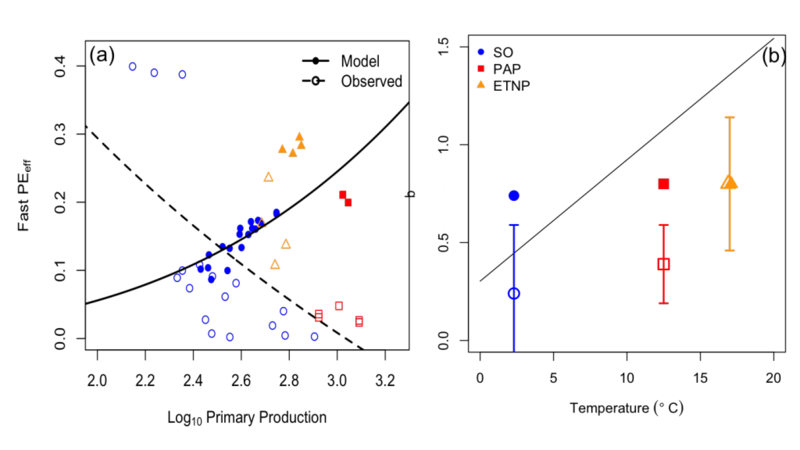 In fact, the time-varying dynamical state of the KE system can be well represented by the KE index, defined by the average of the variance-normalized time series of the southern recirculation gyre intensity, the KE jet intensity, its latitudinal position, and the negative of its path length (Qiu et al. 2014). Figure 2a shows the KE index time series in the satellite altimetry period of 1993–present; here, a positive KE index indicates a stable dynamical state and a negative KE index, an unstable dynamical state. From Figure 2a, it is easy to discern the dominance of the decadal oscillations between the two dynamical states of the KE system. Figure 2. (a) Time series of the KE index from 1993‑present; available at http://www.soest.hawaii.edu/oceanography/bo/KE_index.asc. (b) Year-mean SSH maps when the KE is in stable (2004 and 2011) versus unstable (1997 and 2008) states. (c) SSH anomalies along the zonal band of 32°-34°N from satellite altimetry measurements. (d) Time series of the PDO index from 1989-present; available at http://jisao.washington.edu/pdo/PDO.latest. Transitions between the KE’s two dynamical states are caused by the basin-scale wind stress curl forcing in the eastern North Pacific related to the Pacific Decadal Oscillation (PDO). Specifically, when the central North Pacific wind stress curl anomalies are positive during the positive PDO phase (see Figure 2d), enhanced Ekman flux divergence generates negative local sea surface height (SSH) anomalies in 170°–150°W along the southern recirculation gyre latitude of 32°–34°N. As these wind-induced negative SSH anomalies propagate westward as baroclinic Rossby waves into the KE region after a delay of 3–4 years (Figure 2c), they weaken the zonal KE jet, leading to an unstable (i.e., negative index) state of the KE system with a reduced recirculation gyre and an active eddy kinetic energy field (Figure 2b). Negative anomalous wind stress curl forcing during the negative PDO phase, on the other hand, generates positive SSH anomalies through the Ekman flux convergence in the eastern North Pacific. After propagating into the KE region in the west, these anomalies stabilize the KE system by increasing the KE transport and by shifting its position northward, leading to a positive index state. The dynamical state of the KE system exerts a tremendous influence upon the STMW that forms largely along the paths of the Kuroshio/KE jet and inside of its southern recirculation gyre (e.g., Suga et al. 2004; Qiu et al. 2006; Oka 2009). Figure 3a shows the monthly time series of temperature profile, constructed by averaging available Argo and XBT/CTD/XCTD data inside the KE southern recirculation gyre (see Qiu and Chen 2006 for details on the constructing method). The black line in the plot denotes the base of the mixed layer, defined as where the water temperature drops by 0.5°C from the sea surface temperature. Based on the temperature profiles, Figure 3b shows the monthly time series of potential vorticity. STMW in Figure 3b is characterized by water columns with potential vorticity of less than 2.0 x 10-10 m-1s-1 beneath the mixed layer. From Figure 3, it is clear that both the late winter mixed layer depth and the low-potential vorticity STMW layer underwent significant decadal changes over the past 25 years. Specifically, deep mixed layer and pronounced low-potential vorticity STMW were detected in 1993–95, 2001–05, and 2010–15, and these years corresponded roughly to the periods when the KE index was in the positive phase (cf. Figure 2a). Figure 3. Monthly time series of (a) temperature (°C) and (b) potential vorticity (10-10 m-1 s-1) averaged in the KE’s southern recirculation gyre. The thick black and white lines in (a) and (b) denote the base of the mixed layer, defined as where the temperature drops by 0.5°C from the surface value. Red pluses (at the top of each panel) indicate the individual temperature profiles used in constructing the monthly T(z, t) profiles. The potential vorticity, Q(z,t) = fα∂T(z,t)/∂z, where f is the Coriolis parameter and α the thermal expansion coefficient. The close connection between the dynamical state of the KE system and the STMW formation has been detected by many recent studies based on different observational data sources and analysis approaches (Qiu and Chen 2006; Sugimoto and Hanawa 2010; Rainville et al. 2014; Bishop and Watts 2014; Oka et al. 2012; 2015; Cerovecki and Giglio 2016). Physically, this connection can be understood as follows. When the KE is in an unstable state (or a negative KE index phase), high-regional eddy variability infuses high-potential vorticity KE and subarctic-gyre water into the southern recirculation gyre, increasing the upper-ocean stratification and hindering the development of deep winter mixed layer and formation of STMW. A stable KE path with suppressed eddy variability (in the positive KE index phase), on the other hand, favors the maintenance of a weak stratification in the recirculation gyre, leading to the formation of a deep winter mixed layer and thick STMW. Since the STMW is renewed each winter, due to combined net surface heat flux and wind stress forcing that modulate on interannual timescales, a question arising naturally is the timescale on which the dynamical state change of the KE system is able to alter the upper ocean stratification and potential vorticity inside the recirculation gyre. If the influence of the KE dynamical state acts on interannual timescales, one may expect a stronger control on the STMW variability by the wintertime atmospheric condition (e.g., Suga and Hanawa 1995; Davis et al. 2011). Intensive observations from the Kuroshio Extension System Study (KESS) program, spanning the period from April 2004 to July 2006, captured the 2004–05 transition of the KE system from a stable to an unstable state. The combined measurements by profiling Argo floats, moored current meter, current and pressure inverted echo sounder (CPIES), and the Kuroshio Extension Observatory (KEO) surface mooring revealed that the KE dynamical state change was able to change the STMW properties both significantly in amplitude and effectively in time (Qiu et al. 2007; Bishop 2013; Cronin et al. 2013; Bishop and Watts 2014). Relative to 2004, the low-potential vorticity signal in the core of STMW was diminished by one-half in 2005, and this weakening of STMW’s intensity occurred within a period of less than seven months. These significant and rapid responses of STMW to the KE dynamical state change suggests that the variability in STMW formation is more sensitive to the dynamical state of the KE than to interannual variations in overlying atmospheric conditions over the past 25 years. The decadal variability of STMW in the KE’s southern recirculation gyre is able to affect the water property distributions in the entire western part of the North Pacific subtropical gyre (Oka et al. 2015). Measurements by Argo profiling floats during 2005–14 revealed that the volume and spatial extent of STMW decreased (increased) in 2006–09 (after 2010) during the unstable (stable) KE period in its formation region north of ~28°N, as well as in the southern, downstream regions with a time lag of 1-2 years. Such decadal subduction variability affects not only physical but also biogeochemical structures in the downstream, interior subtropical gyre. 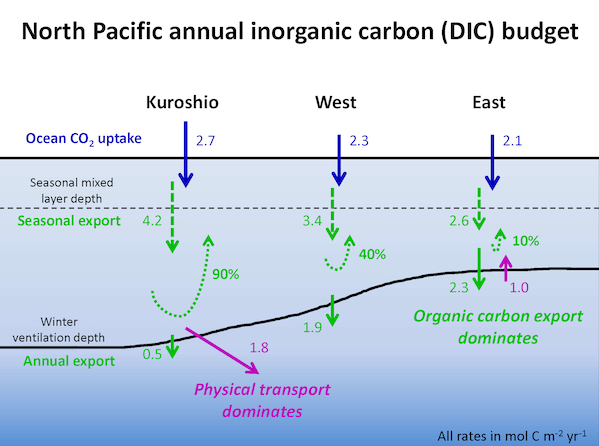 Shipboard observations at 25°N and along the 137°E repeat hydrographic section of the Japan Meteorological Agency exhibited that, after 2010, enhanced subduction of STMW consistently increased dissolved oxygen, pH, and aragonite saturation state and decreased potential vorticity, apparent oxygen utilization, nitrate, and dissolved inorganic carbon. Changes in dissolved inorganic carbon, pH, and aragonite saturation state were opposite their long-term trends. Western boundary current (WBC) regions display the largest magnitude air-to-sea carbon dioxide (CO2) fluxes of anywhere in the global ocean. STMW formation processes are thought to account for a majority of the anthropogenic CO2 sequestration that occurs outside of the polar, deep water formation regions (Sabine et al. 2004; Khatiwala et al. 2009). Once subducted and advected away from the formation region, mode waters often remain out of contact with the atmosphere on timescales of decades to hundreds of years, making them short-term carbon silos relative to the abyssal carbon storage reservoirs. One of the physical impacts on carbon uptake via air-sea CO2 flux is due to the temperature dependence of the solubility of pCO2 in the surface waters. Cooler surface waters during the wintertime months reduce the oceanic pCO2 and subsequently enhance the CO2 flux into the ocean. This carbon uptake corresponds with the timing of peak STMW formation. As mentioned above, the formation of STMW is modulated by the dynamic states of the KE, with less STMW forming during unstable states and more during stable states. To complicate matters, more enhanced levels of surface chlorophyll (Chla) have also been observed from satellite ocean color during unstable states (Lin et al. 2014), which points to the potential importance of biophysical interactions on carbon uptake. Elevated levels of Chla can further modify the pCO2 of surface waters and enhance carbon export at depth from sinking of particulate organic matter following an individual bloom. Given that submesoscale processes result from deep wintertime mixed layers and from the presence of the larger mesoscale lateral shear and strain fields (McWilliams 2016), it is expected that submesoscale processes are also important in STMW formation during unstable states of the KE. An open question in the research community is to what extent do elevated levels of mesoscale and submesoscale eddy activity modulate STMW formation and carbon uptake during unstable states of the KE? With large variations in STMW formation occurring in concert with decadal variability in the mesoscale eddy field, it is possible that submesoscale processes may impact STMW formation through restratification of the mixed layer within density classes encompassing STMW and timing of the spring bloom. These mesoscale and submesoscale processes may then also impact the uptake of CO2 in the North Pacific on interannual to decadal timescales. Bishop, S. P., 2013: Divergent eddy heat fluxes in the Kuroshio Extension at 143°-149°E. Part II: Spatiotemporal variability. J. Phys. Oceanogr., 43, 2416-2431, doi: 10.1175/JPO-D-13-061.1. Bishop, S. P., and D. R. Watts, 2014: Rapid eddy-induced modification of subtropical mode water during the Kuroshio Extension System Study. J. Phys. Oceanogr., 44, 1941-1953, doi:10.1175/JPO-D-13-0191.1. Bishop, S. P., F. O. Bryan, and R. J. Small, 2015: Bjerknes-like compensation in the wintertime north Pacific. J. Phys. Oceanogr., 45, 1339-1355, doi:10.1175/JPO-D-14-0157.1. Ceballos, L., E. Di Lorenzo, C. D. Hoyos, N. Schneider, and B. Taguchi, 2009: North Pacific Gyre oscillation synchronizes climate variability in the eastern and western boundary current systems. J. Climate, 22, 5163-5174, doi:10.1175/2009JCLI2848.1. Cerovecki, I., and D. Giglio, 2016: North Pacific subtropical mode water volume decrease in 2006–09 estimated from Argo observations: Influence of surface formation and basin-scale oceanic variability. J. Climate, 29, 2177-2199, doi:10.1175/JCLI-D-15-0179.1. Cronin, M. F., N. A. 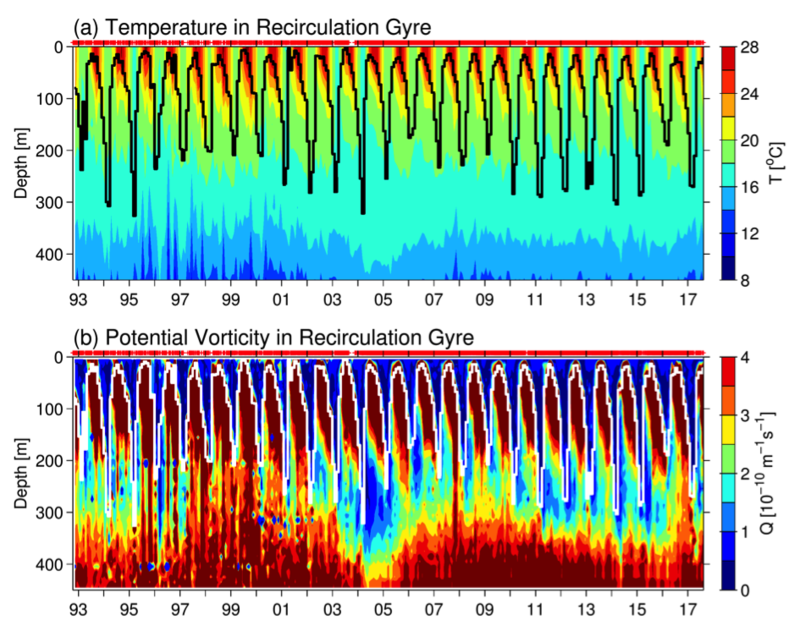 Bond, J. T. Farrar, H. Ichikawa, S. R. Jayne, Y. Kawai, M. Konda, B. Qiu, L. Rainville, and H. Tomita, 2013: Formation and erosion of the seasonal thermocline in the Kuroshio Extension Recirculation Gyre. Deep-Sea Res. II, 85, 62-74, doi:10.1016/j.dsr2.2012.07.018. Davis, X. J., L. M. Rothstein, W. K. Dewar, and D. Menemenlis, 2011: Numerical investigations of seasonal and interannual variability of North Pacific subtropical mode water and its implications for Pacific climate variability. J. Climate, 24, 2648-2665, doi:10.1175/2010JCLI3435.1. Hanawa, K., and L. D. Talley, 2001: Mode waters. Ocean Circulation and Climate: Observing and Modelling the Global Ocean, G. Siedler, J. Church, and J. Gould, Eds., Academic Press, 373-386. Khatiwala, S., Primeau, F., and Hall, T., 2009: Reconstruction of the history of anthropogenic CO2 concentrations in the ocean. Nature, 462, 346–349, doi:10.1038/nature08526. Kelly, K. A., R. J. Small, R. M. Samelson, B. Qiu, T. M. Joyce, Y.-O. Kwon, and M. F. Cronin, 2010: Western boundary currents and frontal air-sea interaction: Gulf Stream and Kuroshio Extension. J. Climate, 23, 5644-5667, doi:10.1175/2010JCLI3346.1. Lin, P., F. Chai, H. Xue, and P. Xiu, 2014: Modulation of decadal oscillation on surface chlorophyll in the Kuroshio Extension. J. Geophys. Res., 119, 187–199, doi:10.1002/2013JC009359. McWilliams, J. C., 2016: Submesoscale currents in the ocean. Proc. Roy. Soc. A, 472, doi:10.1098/rspa.2016.0117..
Oka, E., 2009: Seasonal and interannual variation of North Pacific subtropical mode water in 2003–2006. J. Oceanogr., 65, 151-164, doi:10.1007/s10872-009-0015-y. Oka, E., and B. Qiu, 2012: Progress of North Pacific mode water research in the past decade. J. Oceanogr., 68, 5-20, doi:10.1007/s10872-011-0032-5. Oka, E., B. Qiu, S. Kouketsu, K. Uehara, and T. Suga, 2012: Decadal seesaw of the central and subtropical mode water formation associated with the Kuroshio Extension variability. J. Oceanogr., 68, 355-360, doi: 10.1007/s10872-015-0300-x. Oka, E., B. Qiu, Y. Takatani, K. Enyo, D. Sasano, N. Kosugi, M. Ishii, T. Nakano, and T. Suga, 2015: Decadal variability of subtropical mode water subduction and its impact on biogeochemistry. J. Oceanogr., 71, 389-400, doi: 10.1007/s10872-015-0300-x. 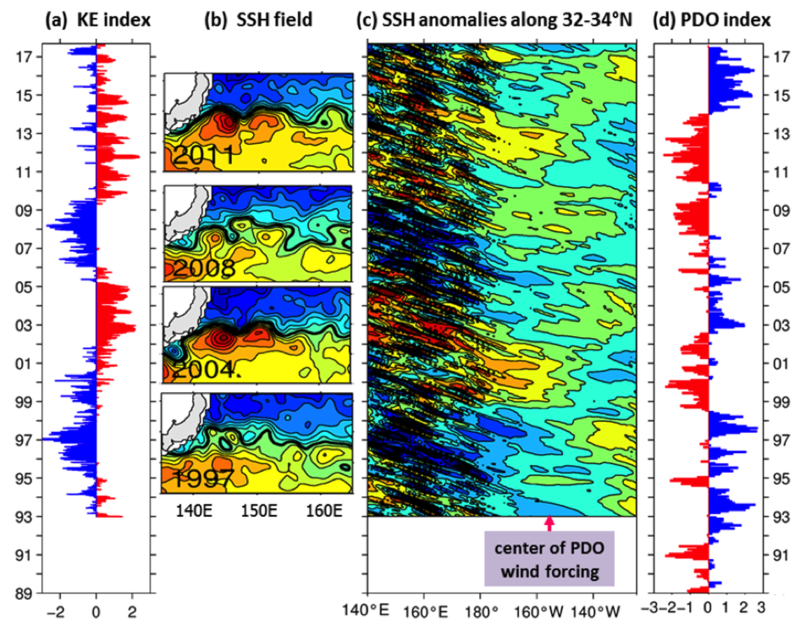 Pierini, S., 2014: Kuroshio Extension bimodality and the North Pacific Oscillation: A case of intrinsic variability paced by external forcing. J. Climate, 27, 448-454, doi:10.1175/JCLI-D-13-00306.1. Qiu, B., 2002: The Kuroshio Extension system: Its large-scale variability and role in the midlatitude ocean-atmosphere interaction. J. Oceanogr., 58, 57-75, doi:10.1023/A:1015824717293. Qiu, B., and S. Chen, 2005: Variability of the Kuroshio Extension jet, recirculation gyre and mesoscale eddies on decadal timescales. J. Phys. Oceanogr., 35, 2090-2103, doi: 10.1175/JPO2807.1. 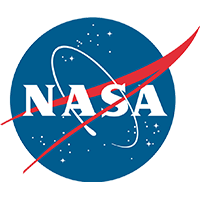 Qiu, B., and S. Chen, 2006: Decadal variability in the formation of the North Pacific subtropical mode water: Oceanic versus atmospheric control. J. Phys. Oceanogr., 36, 1365-1380, doi: 10.1175/JPO2918.1. Qiu, B., and S. Chen, 2010: Eddy-mean flow interaction in the decadally-modulating Kuroshio Extension system. Deep-Sea Res. II, 57, 1098-1110, doi:10.1016/j.dsr2.2008.11.036. Qiu, B., S. Chen, and P. Hacker, 2007: Effect of mesoscale eddies on subtropical mode water variability from the Kuroshio Extension System Study (KESS). J. Phys. Oceanogr., 37, 982-1000, doi:10.1175/JPO3097.1. 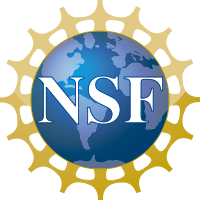 Qiu, B., N. Schneider, and S. Chen, 2007: Coupled decadal variability in the North Pacific: An observationally-constrained idealized model. J. Climate, 20, 3602-3620, doi:10.1175/JCLI4190.1. Qiu, B., S. Chen, N. Schneider, and B. Taguchi, 2014: A coupled decadal prediction of the dynamic state of the Kuroshio Extension system. J. Climate, 27, 1751-1764, doi:10.1175/JCLI-D-13-00318.1. Qiu, B., P. Hacker, S. Chen, K. A. Donohue, D. R. Watts, H. Mitsudera, N. G. Hogg and S. R. Jayne, 2006: Observations of the subtropical mode water evolution from the Kuroshio Extension System Study. J. Phys. Oceanogr., 36, 457-473, doi:10.1175/JPO2849.1. Rainville, L., S. R. Jayne, and M. F. Cronin, 2014: Variations of the North Pacific subtropical mode water from direct observations. J. Climate, 27, 2842-2860, doi:10.1175/JCLI-D-13-00227.1. Sabine, C. L., Feely, R. A., Gruber, N., Key, R. M., Lee, K., Bullister, J. L., Wanninkhof, R., Wong, C., Wallace, D. W. R., Rilbrook, B., Millero, F. J., Peng, T.-H., Kozyr, A., Ono, T., and Rios, A. F., 2004. 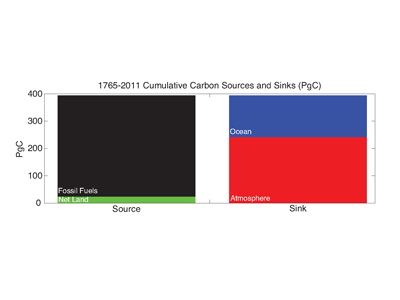 The oceanic sink for anthropogenic CO2. Science, 305, 367–371. Sasaki, Y. N, S. Minobe, and N. Schneider, 2013: Decadal response of the Kuroshio Extension jet to Rossby waves: Observation and thin-jet theory. J. Phys. Oceanogr., 43, 442-456, doi:10.1175/JPO-D-12-096.1. Suga, T., and K. Hanawa, 1995: Interannual variations of North Pacific subtropical mode water in the 137°E section. J. Phys. Oceanogr., 25, 1012–1017, doi:10.1175/1520-0485(1995)025<1012:IVONPS>2.0.CO;2. Suga, T., K. Motoki, Y. Aoki, and A. M. MacDonald, 2004: The North Pacific climatology of winter mixed layer and mode waters. J. Phys. Oceanogr., 34, 3–22, doi:10.1175/1520-0485(2004)034<0003:TNPCOW>2.0.CO;2. Sugimoto, S., and K. Hanawa, 2009: Decadal and interdecadal variations of the Aleutian Low activity and their relation to upper oceanic variations over the North Pacific. J. Meteor. Soc. Japan, 87, 601-614, doi:10.2151/jmsj.87.601. Sugimoto, S., and K. Hanawa, 2010: Impact of Aleutian Low activity on the STMW formation in the Kuroshio recirculation gyre region. Geophys. Res. Lett., 37, doi:10.1029/ 2009GL041795. Taguchi, B., S.-P. Xie, N. Schneider, M. Nonaka, H. Sasaki, and Y. Sasai, 2007: Decadal variability of the Kuroshio Extension. Observations and an eddy-resolving model hindcast. J. Climate, 20, 2357-2377, doi:10.1175/JCLI4142.1. Wijffels, S. E., M. M. Hall, T. Joyce, D. J. Torres, P. Hacker, and E. Firing, 1998: Multiple deep gyres of the western North Pacific: A WOCE section along 149°E. J. Geophys. Res., 103, 12,985-13,009, doi:10.1029/98JC01016.